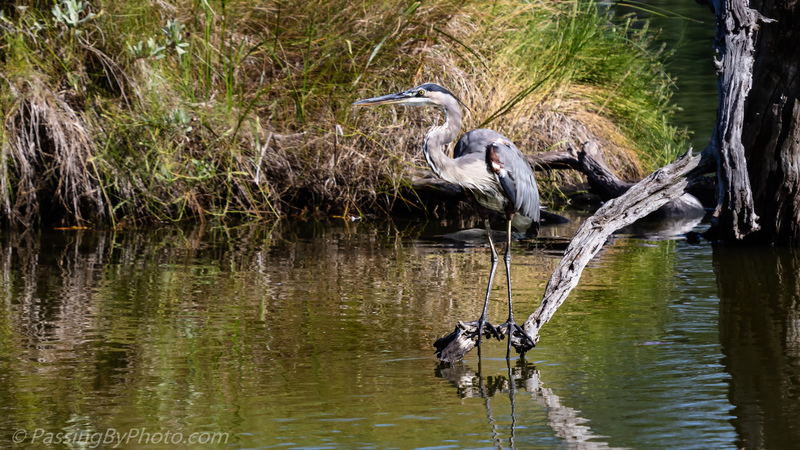 His middle toes just touching the water, this Great Blue Heron perched on a dead limb hanging over the water. In another sign of approaching fall the grasses behind him are turning brown and drooping a bit. The are a big bird, Greta! The Great Blue is the largest heron in North America. Cornell lists their length range at 38.2-53.9 in (97-137 cm). They are just a bit bigger than a Wood Stork at a length 33.5-45.3 in (85-115 cm). Thanks for the extra info Ellen.